I’m closing out 2017 with this playful painting of Lepomis gibbosus, the Pumpkinseed sunfish. 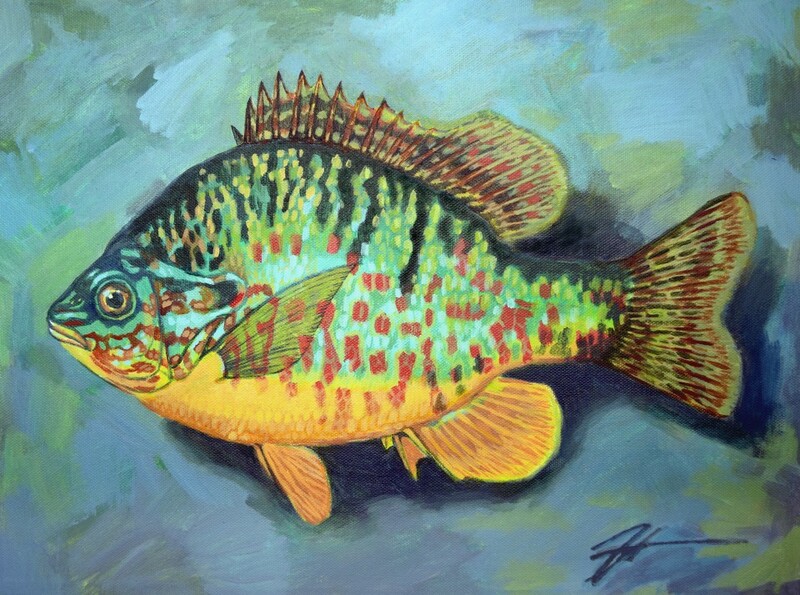 Also known as pond perch, common sunfish, punky, sunny, or kivver, these freshwater fish of the Centrarchidae family can be found in many of Minnesota’s lakes and streams. A coworker of mine has a fishy theme going in her baby’s crib room and asked for a fun, fishy piece to go with it. I decided to channel the Pumpkinseed’s likeness for its playful colors and goofy, chunky shape. Fun fact: the Pumpkinseed uses uniquely adapted teeth to feast fancily on escargot! Beyond fish, 2017 has been a smashing year of art progress for me. Reviewing the last twelve months in my art journal reveals so many successes. So much having happened, I felt the need to reflect on the year in a blog post to capture all my thoughts in one place. In my formal art practice, I have achieved my goal of working with higher contrast, more risk-taking and experimentation with color, and creating the illusion of depth more effectively than ever before. I explored ways of working that I was not entirely comfortable with (cubism, landscape, realism), challenging myself and interrogating my own assumptions along the way. I showed new and old work in three different exhibitions. Additionally, I crushed my previous records for commission earnings, having finished ten distinctly unique pieces of increasing size and complexity. Lastly, and most valuably, I became a member at Vine Arts Center, and joined a committed and dynamic collective of artists working to bring art to the Twin Cities community in a variety of fashions. This has allowed me to more fully submerge myself in art dialog and discourse, an energizing and renewing process. A big factor contributing to this progress is at long last I have the right work-life balance required to generate new art and keep up with marketing it. Thanks, nursing school! Finally having a dedicated studio space is also a mega factor in the equation, not to be overlooked. Most importantly, there are people around me who support my art, come to my shows, ask good questions about my process, and get excited about what I’m making next. Art is a conversation – I am deeply appreciative of everyone willing to have that conversation with me. Alongside these successes, there were a few goals I did not meet. I had good intentions to participate in community art events and collaborate through shared projects. I ran out of time! Moving into 2018, I hope to ratchet up my arts involvement by participating more in community art events. I also may have worked too heavily on commissions and not pursued my own creative projects fully enough. With many ideas floating around in my head, I’ll be sure to find a way to get more of them onto the page, paper, board, canvas, or what have you in 2018. Another goal I have for 2018 is to find a way for my art to add value or perspective to the conversations happening all around us in our social institutions, our media, or political theatre, our environment and universe at large. With all this in mind, I must remember to stay humble, to focus on the core of what energizes me about art, and to keep talking about art with anyone and everyone. Oh, and one more non-art-related resolution: to get out there and eat all the escargot I possibly can, preferably with some uniquely adapted teeth.